A couple years ago, I had a lesson with a former ATP pro and coach of the Chinese Women’s National Tennis Team, Ni Chang Hong. He quickly detected a deficiency in my game that is rampant among tennis players, especially amateurs: falling back while hitting groundstrokes. Throughout my lesson, the coach called me out if I leaned backwards while hitting a shot, and repeated “strong legs” through the lesson. To be clear, there are times when you will have no choice but to lean backwards when striking the ball. You’ll see pros do this occasionally, especially the Spanish contingent who hit heavy topspin and can loop the ball back deep. But many tennis players have a bad habit of not keeping themselves balanced when playing tennis. 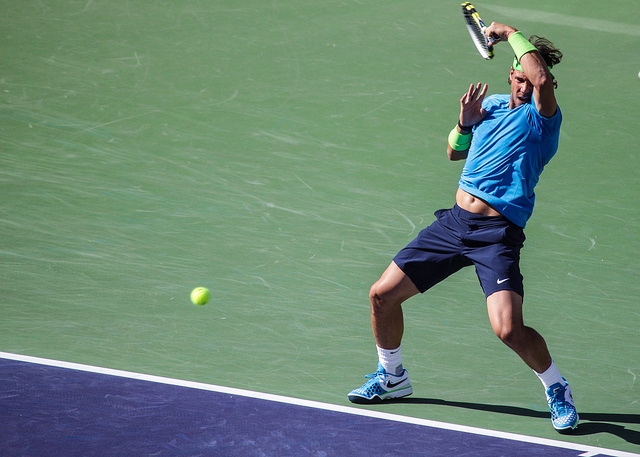 Balance is extremely crucial to your tennis success. If you don’t believe me, consider that during one of Kei Nishikori’s practice sessions at the Citi Open this past year, his coach Dante Bottini performed the very same drill and instructions with the Japanese star that I did with coach Hong. The main instruction I heard from Bottini to Kei on the stadium court during a backhand drill was “balance.” I’m pretty sure the IMG Academy, where Bottini coaches, knows a thing or two about tennis. Check out a clip of the practice, specifically the difference between Kei’s backhands at 54 seconds vs 56 seconds, after Bottini tells him to be more balanced. When I, a mere mortal, had my lesson, I had to elevate my footwork intensity so that I was balanced or leaning forward while striking the ball. And if I was pushed back, I was instructed to backpedal quickly and then shift forward before hitting the ball. If you have enough time to hit the ball, you should have a strong base, and avoid falling backwards to hit the shot. Let’s take a look at the reasons why you fall backwards, an exception, consequences, and how to fix this problem. (1) Not enough time. You fall backwards because it gives you more time and space to hit the shot. (2) Fear of the ball. Perhaps your opponent has hit a strong shot, and you instinctively fall back as a defense mechanism. When I am not confident in my game, this tends to become a problem. (3) Inefficient technique. Your technique or footwork causes you to shift your momentum backwards when you hit the ball. Of the reasons above, #1 is excusable, but only if you truly do not have the time to get into proper position. I say this because you can drastically reduce this occurrence by increasing your footwork intensity and technique during training and matches. Sometimes you will have no choice but to lean back while hitting the ball. Certain situations force even the most aggressive players to lean back to hit the shot and play defense. Just don’t make it a habit. (1) Loss of power. When your momentum goes backwards while hitting the ball, you will lose a substantial amount of power. You will produce more force when you put your weight into your shots. (2) Loss of depth. Your shots will land short or in the net. You won’t be able to muster enough force on the ball to hit it as deep as you could if you leaned forward, unless you can master adding height to your shots (i.e. loop the ball with topspin) while falling backwards. (3) Lose control of the point. The mere act of falling back means you are yielding control of the point to your opponent. It is virtually impossible to be on the offensive if you fall backwards while hitting your shots. (4) Inefficient use of the body. When you hit a ball while leaning backwards, your arm is doing all the work. Hence, you waste energy on your legs and other body parts because even though your body is working hard on the shot, its energy is not being transferred as efficiently as if you were leaning forward, which would let you take advantage of your body’s energy. (5) Injury. Repetitive inefficient technique from leaning backwards will cause you to “arm” the ball. As a result, your arm will overcompensate for the lack of contribution from your legs, trunks, and other parts of your body. This can lead to overuse injury. Here’s what you need to do: Remember the words “strong legs.” This translates to holding your ground and your balance. Be confident, keep your feet moving, and lean in on the ball whenever possible. Your weight should be evenly distributed so that you are balanced when hitting the ball, and when you can take the offensive, transfer your weight forward. Try as hard as you can not to lean back on shots. This will help you to be more aggressive and less passive, which will be great for your game as well. If there is a flaw in your technique that causes you to lean back, commit to fixing it and regaining your balance! If a floating ball comes back deep, you can back-pedal a few steps, and then lean forward when you strike the ball, instead of hitting the ball on the rise if you prefer not to. For the times when you absolutely must lean back, make sure that you end up balanced when you finish the stroke. Here is a video that describes how pros rotate their body and end the shot balanced when they must lean back to create more space. Have an aggressive mind-set, strong legs, work hard on your balance, and your groundstrokes will improve by leaps and bounds. For more helpful tennis tips, download my free eBook below!